We are the masters of jumping castles joy for all ages and physical fitness levels. Every celebration, fun day, fundraiser and team building day is incomplete without the ingredients of fun and excitement. 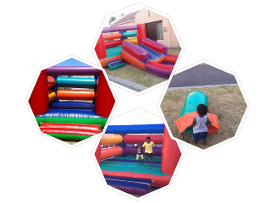 As Umoja Jumping Castles, we pride ourselves in the countless hours of joy that is brought through bouncy inflatables, whether through a single jumping castle or through exciting inflatable obstacle course. With our experience in the industry, we strive to bring fresh and exciting elements of fun to our clients. Our services and products are of the best quality and are easily accessible and affordable for all budget requirements. We have a wide variety of products to choose from. With the highest standards of hygiene and safety, you are guaranteed peace of mind. Our business is built up from Faith in God, Honesty to our clients and an insatiable passion for Jumping Castle Fun. Join in the Fun and Jump High with Joy!! All site content is intellectual property of Umoja Jumping Castles. Any copying of this website's content will result in immediate legal action.